The Bird Garden: Identifying the Little Brown Birds that will be coming along any day..
Identifying the Little Brown Birds that will be coming along any day..
We’re only a couple weeks away from another major migration, unlike the hawks that I mentioned last week, this one won’t be specks in the sky, it’ll happen right on the ground. Well, not the migration, it’s not like they walk north, but you’ll see them on the ground and with very little preparation, you’ll be able to see a lot out of your own window. I’m talking about sparrows, we have a few around now, the American Tree Sparrow is one that we really only see in winter and they are in good numbers. There could be the odd representative of almost any sparrow over winter, Song and White-throated Sparrows aren’t uncommon in winter and the odd rarity will show up and decide it’s easier to stick it out here than try to make the long, dangerous journey south. Soon though, we will have thousands of sparrows passing through and if you don’t have them on your various lists, it’s a good time to brush up on field marks and get ready with a little feed. So many people simply pass over sparrows when birding, lumping them into one category, LBB’s (little brown birds) or LBJ’s (little brown jobs). 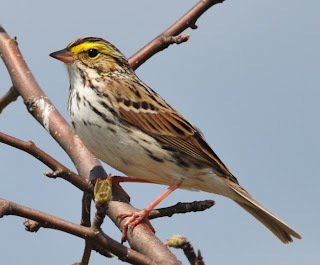 I remember hearing the latter for the first time, a birder from the US, I thought he was saying this beautiful Savannah Sparrow reminded him of their former president. I just let it go. If you don’t take a closer look you’re really missing out, and now is the time to see them at their best and brightest. They’ll be wearing there finest plumage and the differences will be standing out (and outstanding), later in the summer and fall they’ll have worn feathers, be molting and those pesky immatures will be hanging around in their drab feathers. Spring is the time, once you are comfortable with identifying adult males move on to adult females, then after a few years and many hours studying you might get proficient with the fall sparrows. If you say you just can’t tell the difference between a spring Savannah, Song and a White-throated male, then you aren’t really trying. Start by narrowing the groups, does it have a streaked breast? Yes, then it’s a Savannah or Song. That was easy... does it show yellow through the streaks on the head? Then it’s a Savannah. You say, the White-throated also shows some yellow, but the White-throated has a clear breast, it’s an elimination game, you just need a few broad clues to greatly narrow the choices. The other broad group is the rusty capped sparrows, Chipping, Tree, Field or Swamp would be the first choices. Dot on the breast...Tree. Black line through the eye, white line over… Chipping. Pink bill, white eye ring… Field. White throat, no wing bars... Swamp. I know that’s simplifying it, but it’s a great place to start. There’s always going to be some that will leave you scratching your head, but if you don’t dive in you’ll never get it. For beginners I’d recommend an “Eastern” guide, even checking facts for this column I had to ditch the “big” Sibley’s guide, there are so many species included, it’s hard to keep them straight. I still go to Peterson (but Sibley’s Eastern is great too) for our common sparrows, I’m familiar with the layout and without Peterson, I’d still be glancing over the LBB’s and really missing out. Soon I’ll get with the times and have all the guides on an iPod or iPad so I can have all the experts in my back pocket. It’s about time, all my (very) much older birding friends have one, and I can always get my 6 year old to teach me how to find things. Now that you’re ready with guide in hand, you’re really going to need a pair of binoculars, they don’t have to be great or even good for that matter, but if the bird is much more than 20 feet away you won’t be able to see the subtleties. Find that old pair you inherited from WW1, dust them off, polish the up, and put them on the window sill. To make things easier and to increase your chances of attracting many of our sparrow species, pick up some white millet. It can be fed on a raised platform, (fancy name for a board nailed to the top of a post) or just spread on the ground. Put it within viewing distance of the window you spend the most time. All winter I throw it on the snow, in evergreen trees and in the middle of a very dense honeysuckle bush. Some gets eaten by our winter sparrows, juncos and Mourning Doves, but I know a lot of it get covered by snow. No big deal, it’s very waterproof, compared to some things like cracked corn, and as the snow melts and the sparrows arrive, it’ll be exposed and eaten. If you do feed cracked corn, put it in an area separate from your sparrow setup, it’ll be attracting all kinds of black birds and jays, not that there’s anything wrong with that, it’s just they will be needlessly chasing the sparrows away from the millet. Once you attract the sparrows and have some identified, watch them, you can learn a lot more by observing their behavior, seeing them from all sides and how they compare to the other sparrows in the bunch than you ever will from a photograph. Clicking the bird name links to a picture on Birding New Brunswick.